Philip McGurk became the first man to lap the Isle of Man TT circuit at over 100mph with a BSA Gold Star engine when he covered the 37.73 mile course in 22 minutes 24.43 seconds. 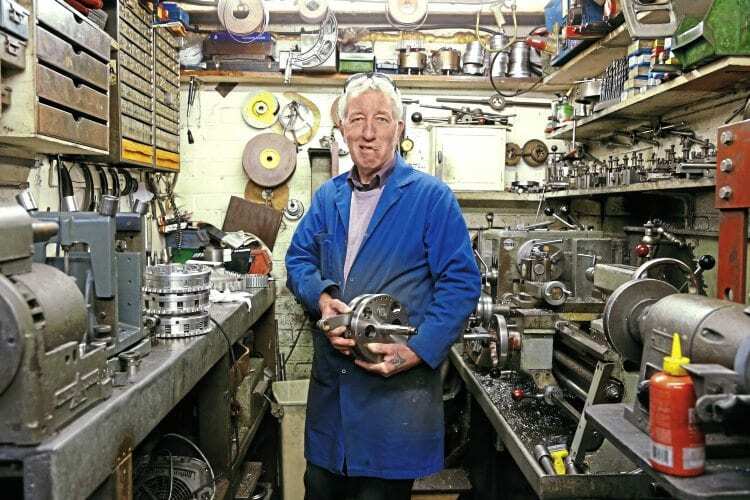 The Pearson workshop, showing Phil with one of his new cranks for the DBD34 Gold Star. His 101.030mph second lap of the Senior Classic TT brought his average for the four laps to 99.943mph, just three seconds outside the magic 100. Through the Sulby speed trap his speed was 129.30mph. McGurk finished 14th in a race dominated by Paton twins, the MV Agusta triple, and Manx Nortons. McGurk was entered by Dave Hardman, whose Featherbed-framed special used a short-stroke engine developed and built by Phil Pearson, a Norfolk engineer who has been working on Gold Stars for nearly 50 years. While a 1956 DBD34 delivers about 42bhp at the crank, the Pearson engine puts out over 50bhp at the rear wheel. How did he do it?